Raised in Trujillo Alto, just outside of San Juan, Puerto Rico, Sergio is a 3rd year BBA student majoring in Marketing. He spent 2016 in Germany pursuing one of his longtime goals of learning German. Sergio’s interests range a full gamma, from the film, having attended the 2014 Cannes International Film Festival and producing several awards winning an official selection short films, to engineering, to having studied 2.5 years of Aerospace Engineering at Georgia Tech. While in Atlanta, Sergio worked as the Production Coordinator at the Georgia Tech Research Institute. He currently serves as the President and CEO of a creative startup agency in Puerto Rico. His aspirations take him to the business side of the film industry. From Guaynabo, Puerto Rico, Laura is a Major Accounting college senior at InterAmerican University of Puerto Rico, Metropolitan Campus. She works as an accountant for a Healthcare Company in Puerto Rico and she also is the secretary of the Accounting Student Association, InterMetro Chapter. Laura has represented her University in various competitions, such as Professional Accounting Bowls and Company Game Competition. She also had the opportunity to do a Summer Abroad in EADA Business School, Barcelona, where she had the opportunity to learn with different case studies. This motivated Laura to participate in Case Study competitions, such as NIBS. Laura plans on becoming a Certified Public Accountant shortly and afterward plans on doing a Master’s Degree in Finance and Accounting, and a Doctorate Degree in Administration and Direction of Companies. Kenneth was born in Puerto Rico and grew up in Caguas. He is his 4th year of college and pursuing a Bachelor’s Degree in Business Administration with a concentration in Accounting. 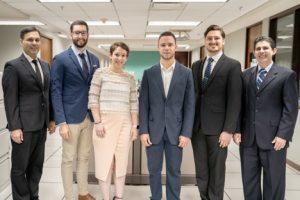 Kenneth is currently the President of the Accounting Student Association and the President of ALPFA (Association of Latino Professionals in Finance and Accounting) in the Inter American University. As much as he enjoys accounting, Kenneth likes the areas of business administration and marketing as well. He is pleased to be part of this competition because he know it will help him develop areas outside of accounting. Born in Puerto Rico, Manuel is a 3rd year Bachelor concentrating in Marketing. Manuel participates as a student member of the University’s Entrepreneurship Center. Previously, he worked with a Small Business Development Center (SBDC) as the marketing consultant of the Business Excellence Acceleration Program (2017-2018). He has a passion for the performing arts, which led him to both participate and work in the Inter American University of Puerto Rico’s Theater Association. This same passion has led him to study music, martial arts, and acting. Manuel aspires to work in the film industry as a stunt coordinator/actor while offering his services as a marketing consultant with a focus on social media and visual content creation. An Assistant Professor of Accounting, and co-advisor of the Inter American University case study association, Angel teaches Managerial Accounting, Taxes, Auditing, and Business Law in the school’s undergraduate and MBA programs. He grew up in San Juan, Puerto Rico, where he become a Certified Public Accountant (CPA) and also studied a Juris Doctor (J.D.) at the University of Puerto Rico. Before completing his DBA at Walden University in Minnesota, Angel worked as a Senior Auditor with PricewaterhouseCoopers (PwC), a Senior Treasurer with Pfizer Pharmaceuticals, and a Secretary with the Department of Treasury of Puerto Rico. Among his interests, Angel supports different student and community initiatives in areas of entrepreneurship and small businesses. Alejandro is an Associate Professor of Accounting and co-advisor of the Inter American University case study association. He teaches Financial Accounting, Taxes, and Research in Accounting in the school’s undergraduate program. He grew up in San Juan, Puerto Rico, where become a Certified Public Accountant (CPA). Additionally, Alejandro is currently a Ph.D. student in the Business Administration-Accounting/Finance program of Trident University in California.